Folks looking for caffeinated blasts know Keurig Green Mountain (GMCR) for the popular Keurig platform that brews up coffee in one-cup servings. It may also be known for its carbonated beverage platform in a few months if it lives up to the hype. Keurig Green Mountain took another big step last week ahead of the fall rollout of Keurig Cold, inking a deal with Dr Pepper Snapple Group (DPS) that will find the retail beverage giant putting out its soft drink brands as flavor options for the new machine. It's a big deal. Beyond Dr Pepper, this is the beverage company behind A&W, Canada Dry, 7Up and Crush. These are some big brands that will join industry leader Coca-Cola (KO) in supporting Keurig Cold at its launch later this year. Coca-Cola was an early supporter, announcing its support when plans for Keurig Cold were revealed 11 months ago. Coca-Cola offered up its iconic pop brands as available flavors. It was also willing to put its money where its bubbly mouth is, ultimately investing roughly $2 billion for a 16 percent stake in Keurig Green Mountain. It was Coca-Cola's first big investment of 2014, which it followed a few months later by taking a position in fizzy energy drink behemoth Monster Beverage (MNST). 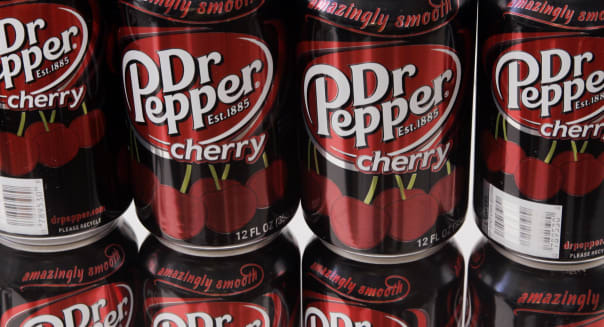 The Dr Pepper deal is a refreshing surprise. Keurig Cold is several months away from hitting the market. There are no guarantees that it will succeed. Keurig dominates the single-serve coffee market, but will the market warm up to a machine that makes juice drinks, carbonated beverages, energy drinks, iced teas and enhanced waters? Cobweb-covered attics and dusty top pantry shelves are filled with once-trendy beverage makers that have fallen out of favor. However, the real reason Dr Pepper Snapple Group's endorsement is turning heads is Coca-Cola's financial stake in Keurig Green Mountain. If Keurig Cold is successful -- and Dr Pepper's presence makes the machine that much more likely to reach a large audience -- it will benefit its larger rival. Keurig Green Mountain has a lot riding on Keurig Cold. It's been hyping the beverage maker's arrival since early last year, and last month it invested $220 million to acquire Bevyz, a European company that's also working on a single-portion multi-drink system. This isn't an easy market to crack. SodaStream (SODA) had initial success with its namesake maker of carbonated beverages, but stateside sales have been falling since late 2012. Keurig Green Mountain is hoping that its brand name and now its connections with two of the three biggest players in the soft drink industry will help it stand out. It's also banking on a platform that does more than fizz up flat water by providing a wide spectrum of beverage choices that could fare well in a climate that's souring on traditional carbonated sodas. The future may be fuzzy, but Keurig Green Mountain is hoping that it's more than just fizzy.